Wake up and enjoy breakfast at your cabin or at the Log Cabin Cafe in Silvergate. We really enjoyed this restaurant. It serves breakfast, lunch, and dinner. Opens at 5:30am! Head out early to the Lamar Valley. Early morning (between 6am-10am) and evening hours are your best times to see wildlife but it’s also largely a matter of luck. If you rise early, you’ll have a much better chance of spotting wolves or grizzlies. When we visited, we could hear the wolves howling and enjoyed watching a grizzly bear in the distance. Pack snacks and head out early, just after sunrise, to hang out for an hour or so at one of the Lamar Valley pullouts. Look for one with cars already parked--it will indicate that the devoted wolf watchers are there and looking. These avid wolf watchers are also fun to watch....Some of them will even share their spotting scope with you when they see something of interest. Good viewing areas begin roughly a mile east of Soda Butte cone to the last turnout (Fishermans) before the Lamar Canyon. The Slough Creek area is another good spot-- from the Slough Creek campground road entrance to the Yellowstone Picnic area. My family really enjoyed this short, easy hike to Trout Lake. It’s starts steep but gradually flattens. Round trip is 1.2 miles. Plan a couple of hours for this one, so you can hang out at the lake for a while basking in the beauty that surrounds you. The trail starts from a small pullout about 1.5 miles (2.4 km) south of Pebble Creek Campground on the Northeast Entrance Road and climbs about 150 feet (45.5 m) through Douglas-fir forest to the lake. Pack a lunch and enjoy a picnic at the lake. Remember to pack your bear spray. This 3.7 roundtrip, moderate loop hike is steep at the beginning and then levels off with nice views of the Yellowstone River far below. It’s a good place to spot bighorn sheep. The Trailhead is located on the Northeast Entrance Road, just east of Tower Junction. Look for a sign simply labeled “Yellowstone” with a picnic table icon. The trail heads northeast; at the trail junction turn left and descend to the road. (The Specimen Ridge Trail, strenuous and poorly marked, continues northeast.) Walk west along the road for 0.7 mile (1.2 km) to the Yellowstone River Picnic Area. Directions to Trailhead: Yellowstone River Picnic area, 1.25 miles (2 km) northeast of Tower Junction on the Northeast Entrance Road. Spend the afternoon on the porch of your cabin. You’ve paid for it, go enjoy it! Spend some time playing cards, exploring your nearby surroundings, and take in the silence and the beauty. If inclined, head back out to the Lamar Valley at dusk for more wildlife viewing. There are not many dining options, but the ones they have are indeed good. Cook dinner at your cabin, eat at the nearby Log Cabin Cafe in Silvergate, or check out Miner’s Saloon in Cooke City for pizza. 208 Main St. The pizza is really good, and apparently they cook a mean burger. We had the special for the day: Bahn Mi Sandwiches and they were terrific! Did you like this simply awesome day in Yellowstone National Park? This itinerary will highlight ways to avoid the crowds and still experience the grandeur of Yellowstone. 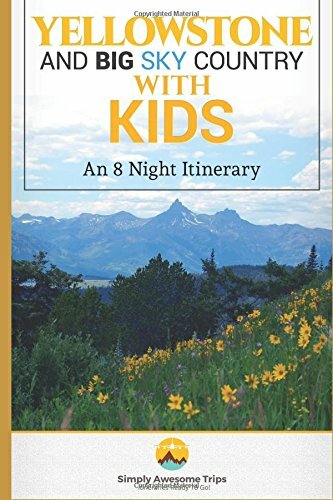 You will begin your trip with an overnight in Livingston, MT, then venture on to the least crowded section of Yellowstone in the Lamar Valley and Montana’s Beartooth Mountains. You will then join the crowds for a one day exploration of the geysers and mud pots of Norris Basin and the falls of the Grand Canyon of the Yellowstone. You will finish your trip at Old Faithful before returning to Bozeman, MT for the night before your return home. If you prefer to purchase the itinerary on Amazon, it is available there as well. To see more photos from this trip, visit the album on our facebook page.